This morning, as I munched on my toasted “everything bagel” with butter, I was inexorably drawn back to my years in New York City, one of the bagel capitals of the world. Prior to moving there, I had certainly had my share of these round wonders. Panera makes a fine bagel, if I do say so myself. However, there really is something to be said for the culture of bagels in New York, something I have experienced nowhere else. In fact, by the time I had graduated from college, I declared myself to be a person who really didn’t like bagels. And if you just thought to yourself that I must be crazy for holding that opinion, get in line. My friends thought it was incredibly bizarre. I think I just had a natural aversion to them for years. I have never liked using bagels for sandwiches, either. Too thick and chewy for a sandwich, at least from my perspective. The idea of a plain bagel with cream cheese sounded incredibly unappetizing to me (in fact, it still does). 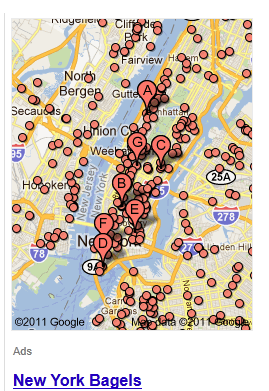 Google "NYC bagels" and this is what you get. However, something shifted for me when I lived in New York. Not only are bagels everywhere – bodegas, delis, bakeries, cafes – but people line up for them like they’re going out of style. A distinct Sunday Morning Bagel Ritual takes place in hundreds of shops each week in that grand city, where thousands of people slowly gravitate towards their favorite local place to “get on line” and call out their regular order. And no two are the same! I was in New York for five years but I probably didn’t appreciate the bagels there until the last two. At the last place I worked, they had Bagel/Donut Fridays. Usually there was no stopping me from partaking in a donut or two, but one day, I started noticing a particular bagel staring back at me. I later learned that it was called an “everything” bagel. On top of these round creations are poppy seeds, sesame seeds, garlic, dried onion, and salt. Craving something salty to go with my sweet donut, I tried one. I loved it. Everything bagels renewed my palate for this local delicacy. They’re insanely messy to eat and you will spill no less than three thousand pieces of bagel debris on yourself while you eat it, but the mixture of flavors can’t be beat. I became a total convert. And! I even started frequenting Brooklyn Bagels in my neighborhood (though I lived in Astoria, Queens). There was one on Broadway around the corner from me and they had a great array of things to eat, including French Toast Bagels, which I don’t even have to say were amaaaaaziiiiing. One had to get to this place before 10am on Sundays or there would be at least a fifteen to twenty minute wait. It was worth it, though. Like the rug in The Big Lebowski that tied the room together, frequenting my local bagel shop for my “usual” really solidified the love I had for my neighborhood, and even living in that enormous metropolis. (Astoria rocks and if I were to move back to New York City, I’d totally live there again.) I have extremely fond memories of getting breakfast at Brooklyn Bagels with Kevin when we were first seeing one another. Can you beat an everything (or French Toast) bagel with a cappuccino? I propose that you can not. While I now have to settle for buying my everything bagels by the half dozen in a bag from the supermarket, toasting them myself and buttering them, they still bring forth these treasured memories which I hold dear to me. Bagels are more than just “something to eat” in New York City. They are an experience. They are New York. A satisfying breakfast to say the least. There are people here who have never even heard of a bagel…Im like…WHAT. You are so right about Bagels and NY. Nobody does it better! I could not live I a world without chocolate chip cookies! 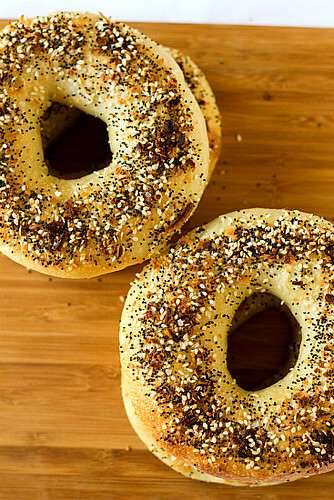 The best bagels are boiled in water, not straight-baked. That is one reason why a panera bagel (while ok) will never taste as good as a REAL NY bagel. I totally agree, Julia! Since I’ve been back in the Midwest, I have yet to eat a Panera bagel, though ten years ago or so, their cinnamon and sugar ones were delicious. I lived in many places in NYC and one of those years was on the UES. I underestimate how early those places can get packed. wow, look at all the bagels! I wonder how many pretzels there are? I am going to have to look it up. I have an everything bagel every morning for breakfast at work! They are tasty and yes very messy. The last time I went to the store they were out of everything bagels so I had to get plain. Plain just isn’t the same. No, plain is rather sad haha. Everything bagels are where it’s at. I have never had a New York City bagel, but you sure may make me hungry for one now. If you ever get to New York, it’s a must! Along with about ten thousand other things haha. Oh man I LOVE everything bagels! AGREED x 1000. My whole summer in Nashville, I woke up every morning wanting to cry knowing that I couldn’t have access to good bagels. Let alone schmear of decent lox spread! I’m down for that! Still holding out that there’s a slim chance I can visit before the end of 2011….